Well, starting later this year in Singapore and next year in Hollywood, a continuation of that experience might be happening. I like competition and Universal Creative has been giving WDI a run for its money. Especially with "Harry Potter and the Forbidden Journey." Which is a fantastic experience as a mini-park/attraction. It's the perfect example of how someone other than Disney can create a Disney type of experience. And it succeeded beyond Universal's dreams. It's a Disney attraction that's not a Disney attraction. The quality of the rides, shops and merchandise, well, everything really, is phenomenal. And as I said in that old article, if they keep it up then the Mouse had better start to move quicker because they've got serious competition. 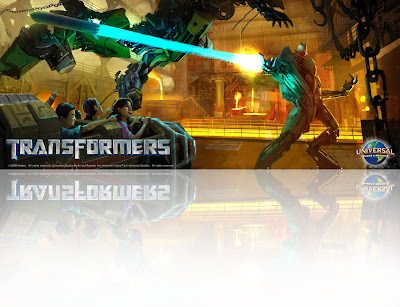 The next test of that will happen when "Transformers: The Ride" opens at Universal Studios Singapore in 2011 and Universal Studios Hollywood in 2012. If that attraction winds up being of the same quality as the Potter attraction then you can bet that Imagineers will be looking in the rear-view mirror. Not that I feel that it's a bad thing. Having WDI have to bring their best game is a good thing for them and us. We will both benefit from the challenges they each face trying to pry those dollars from our hands. Well, recently some artwork for the queue/loading area was leaked and it shows a great deal of attention to design. Universal has already mentioned that thirty minutes of story is built into the queue, so guest will be immersed in the world of the Autobots and Decepticons for a good part of the wait. Details like this will create an experience that could rival the Harry Potter ride. Hat Tip to /Film via Theme Park Insider. I Love the Disney theme park experience, and that is why I love the Wizarding World of Harry Potter sooo much. Its a classic and pushes the industry forward just like Indiana Jones Adventure did 16 years ago. Yep you read that right, 16 years ago. By my reckoning, that is the last time Disney opened a new attraction that truly changed the theme park world and put everyone else on notice that they are king of the mountain. WDI is not to blame. Imagineering has some of the best and brightest out there, but the corporate monster has such tight holds on the purse strings that true innovation is lost. Spend the money and people will throw their wallets at you. I'll back up a moment and give credit to Toy Story Mania. It is a great ride and a step forward, but does it have the epicness of Potter? Not quite. Still darn good though. I'd say WDI has been resting on it's laurels for a god decade at this point, especially in Florida. In O-town, WDI is playing catchup. Further corrupting of Disney by other Hollywood studios. The idiotic changes made to the Disney World Haunted Mansion this year seemed like a response to Harry Potter. A video game ride? In my opinion, its a flash in the pan. Star Tours 2 and Mermaid are very nice it seems, but Potter and now Transformers are the real game changers. Any word on if there are plans to bring the Wizarding World or parts of it to Hollywood? The whole section where T2 is current located would be a perfect fit IMO. Seems like there is space for Hogsmeade and Hogwarts. 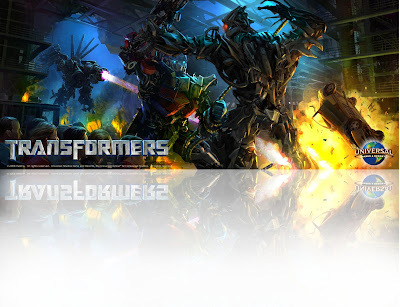 Is Transformers similar to Harry Potter with the Kuka arms, or more like Spiderman? Looks like it's on a track system, not kuka arms. Potter is great because of the ride as well as the recreation of the world around it. Transformers doesn't have that going for it. The ride may be fun, but you aren't getting a whole new land. "...a Disney type of experience..."
"...a Disney attraction that's not a Disney attraction." Really? Seriously??? Honor, you dishonor all theme park and potter geeks with such assertions. It is well known that disney negotiated with Rowlings about a Harry Potter attraction. It is also well known that disney (in their arrogance and hubris) blew it when she insisted upon signatory creative authority and disney declined. When Universal approached her, they agreed to her terms and the rest (thank goodness) is history. However, you are right about one thing: "Imagineers will be looking in the rear-view mirror." Because WDI is going to implode (from their own arrogance and weakness) as dysfunctional disney continues to worship bean-counters and marketing "experts" over the creative help. I'm glad Harry Potter didn't end up at the Disney parks for one reason: The films were NOT Disney movies. However, if Eisner wasn't so cheap and agreed to make the series instead of Warner Bros., then yes, it should be at Anaheim, Orlando and around the world. I feel passionate about this. Maybe buying Lucasfilm would work. "And as I said in that old article, if they keep it up then the Mouse had better start to move quicker because they've got serious competition." Give me a break.... There is absolutely nothing that Universal can do that would make them serious competition for Disney. NOTHING!! I don't care how good the Transformers ride is. The numbers prove it. WDW's attendance remained flat last year. If HP was hurting Disney, we would have have seen a drop in attendance. Plus, in two years when everybody forgets about HP, Universal's attendance will drop again and they'll still be saddled with the debt from HP.